McCormick senior Alex Van Atta, Associated Student Government student groups vice president, discusses the funding process at the Senate meeting Wednesday. ASG confirmed the 2014-2015 Operating Budget, which added funds for students with financial need and a new Wild Ideas Fund. Associated Student Government approved the operating budget for the 2014-15 fiscal year Wednesday which proposed the addition of a need-based student leadership support fund and the reallocation of money to create a new “Wild Ideas” fund. The Wild Ideas fund, which was cut to $20,000 from its original $25,000 allotment, will allow students and student groups to request funding for new ideas and initiatives. The fund reallocated money from the 10K Initiative and the Senate Project Pool to instead create one common pool of money. The new fund was formed in an effort to create a more easily accessible way for students to request money. McCormick senior Alex Van Atta, vice president for student groups, said having two different funds created more difficulty for students requesting funding. The funding proposals for the Wild Ideas Fund will first be reviewed by members of the Student Activities Resource Committee before being brought to Senate to ensure applications comply with ASG policies and goals. Additionally, Senate will have the option to defer the decision to the student body in a campus-wide vote, similar to the 10K Initiative. The ASG budget committee also proposed the development of both a student leadership support fund of $10,000 and an ASG need-based fund of $4,000 to be included in the operating budget. Both funds would be need-based, and the ASG specific fund would change yearly depending on the need of the current executive board. The $10,000 fund was created to help students with financial need who would otherwise not have time to take on student leadership roles. The fund benefits students who may forgo a position in order to get a work-study or other paying job. Although Senators debated over the legitimacy of the separation between the two funds after Alex Deitchman, off-campus caucus whip, proposed an amendment that would combine the two need-based funds, members of the budget committee encouraged ASG to support the idea because the student leadership fund would have the potential to increase with donations from several different sponsors. The ASG fund, however, would come solely from the student activities fund and be regulated based on need. Therefore, to ensure fair distribution of money to students in different groups across campus and to not compromise the objectivity of this allocation, the Budget Committee pushed for the separation of the two funds. “We want the $10,000 to grow so we’re using that $10,000 as our show of support and then working to receive funds for that fund from alumni, from different departments on campus and really fundraising to raise that amount up more,” Van Atta told The Daily. ASG president Julia Watson said members of Senate have already spoken to administrators who have expressed support for the fund and the reasoning behind its creation. Senate ultimately approved of the creation of both funds in a roll call vote. The addition of the ASG need-based fund was coupled with the elimination of the stipend normally given to the vice president of technology. This year’s budget also included a special fund to reward student groups who have adopted environmentally friendly practices. Students from Northwestern University in Qatar also attended Senate and spoke about their experiences and their positions on their Student Union. Representatives said their student government is much smaller than ASG and mentioned issues they hope to address including communication problems between students, faculty and staff. Senate approved a proposal to lend support to the creation of a bike path on Sheridan Road. Christina Cilento, associate vice president for sustainability, said this would show Evanston that NU students support the initiative and would give the “go-ahead” to the city to develop the additional lane. 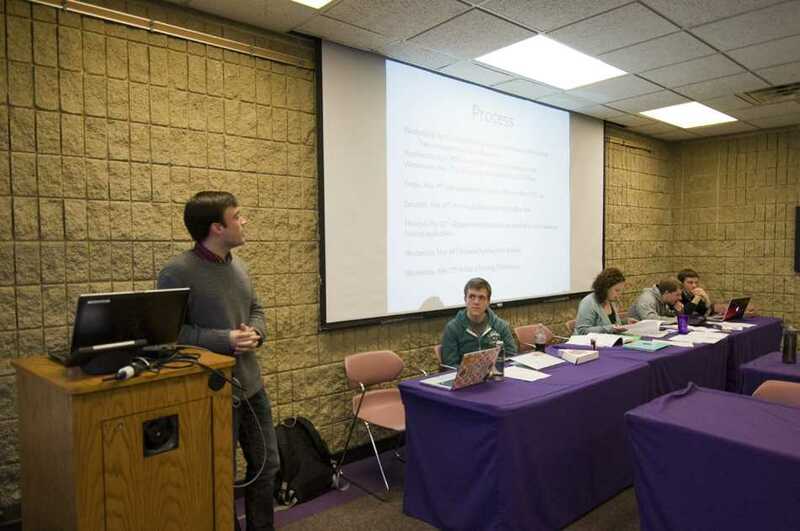 Another proposal requiring that all ASG sponsored events go through the Sustainability Committee’s Green Events Consulting team was also approved, in an effort to ensure the University engages in environmentally-friendly practices. Senate also voted to allot $500 from the Project Pool to members from Alianza and the Fiedler Hillel Center for their collaborative event called Bat Mitvanera, which will likely be held later this month. ASG also discussed B-status funding recommendations for Fall Quarter. More than 50 student groups applied for funding, and the proposed allocations will be voted on at the next Senate meeting which will be held on May 21.